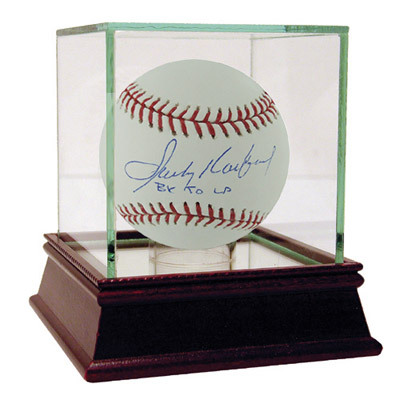 Sandy Koufax Autographed 'BK To LA' MLB Baseball with a Steiner Sports Certificate of Authenticity! Includes a Steiner Sports Certificate of Authenticity. Item will ship within 3 business days of purchase! An additional fee of $20.00 will apply for delivery to Hawaii, Alaska, and Canada and will be added to the fulfillment record prior to shipping. We will be unable to accommodate deliveries to any other international destinations. Sandy Koufax was the most dominating pitcher of his generation. His career peaked with a 6-year run like no other in the history of the game from 1961-1966 a period of time that included 6 straight All-Star appearances 3 Cy Young Awards and a NL MVP Award in 1963. From 1963-1966 he won 97 games and lost only 27. A 4-Time World Series Champion and 2-Time World Series MVP Koufax played his entire career for the Dodgers organization first in Brooklyn and then in Los Angeles. He threw 4 No-Hitters and one perfect game and made national headlines for his controversial decision to not pitch during Game 1 of the 1965 World Series the game fell on Yom Kippur the most holy day in the Jewish religion. His career was cut short due to a bout with arthritis at the age of 30. As a result he became the youngest player to ever be elected to Baseballs Hall of Fame in 1972 at age 36. brbrKoufax has hand signed this MLB baseball and added the inscription 'BK to LA.' Each piece will include a Steiner Sports Certificate of Authenticity and will also be photographed and registered within the On-Line Authentics database. Shipping & Handling: $10 within the contiguous United States. If shipping to Alaska, Hawaii, Puerto Rico, or Canada $20 additional. For additional quantity, shipping is $10 each.